The Thon Cha Tri is a single headed drum seen on the left side of the picture. The drum on the right side is the Ramana Drum. Different types of wood can be used to make this drum. Usually some kind of hard wood but wood from fruit trees is also used. The head is around 20 cm in diameter. 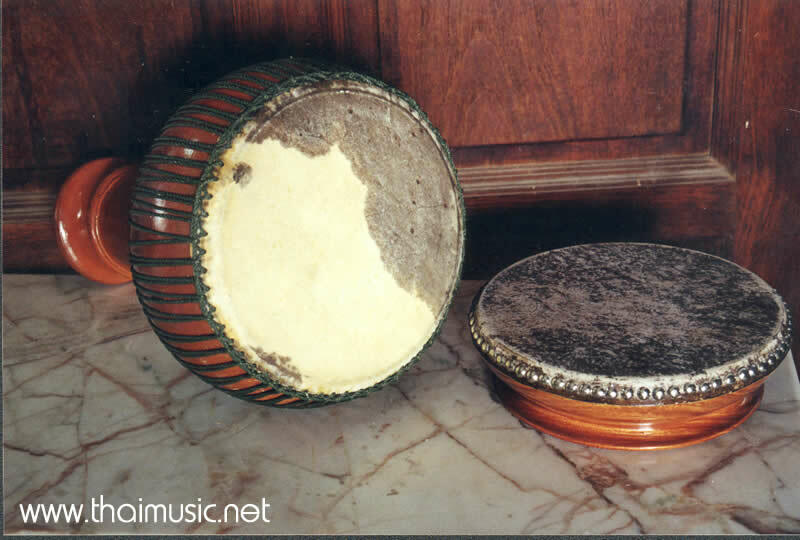 The drum is played using one hand and the other is used to hold the tail of the instrument. The hand is inserted in the hollow end and can be moved in and out to open and close the end. This produces a damped (closed) or reverberating sound ( open ) . This drum is mainly used in the Pi Phat cha tri ensemble . It also appears in the regular Pi Phat and the Kherang Sai ( string ensemble ) .